The daddy of all bar menus has been discovered and in Gurgaon because poetic justice isn't just something bored Eng Lit students study. Sandys Cocktails and Bar which comes at a pricey Rs 2,400 also comes with a unique menu which has a two-page spread dedicated to the owner of the bar - a man named Sandy. This chappie's hobby is to apparently wake up in bed with 'shoes and girls still on'. His other hobbies include eating 'sodden coasters thinking it's a sandwich, and riding a bike at midnight - drunk'. Sandys, with a side of Sandy who is basically just your average paragon of virtue. 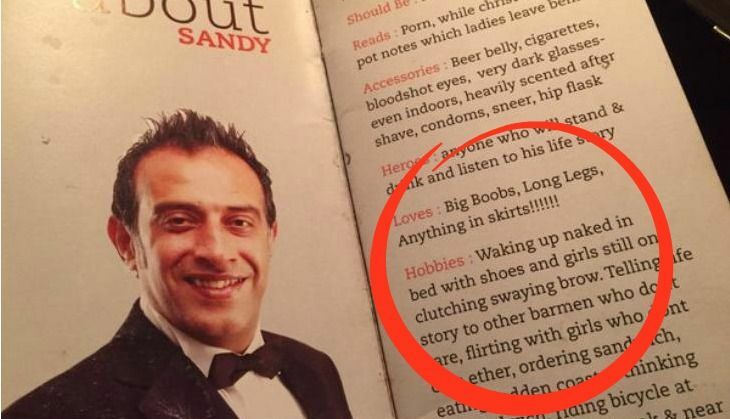 It is easy to see what Sandy's trying to do here; every line of that About Me section is catering to the 'hip high-end' crowd that's drawn like a moth to a flame as soon as they get the whiff of an overpriced menu mixed with the right type of toilet humour. Of course, you cannot raise somebody's standard from rock bottom or give a boost to a sense of humour that's in the larval stage, but we can try. Social media, let's help this man.